In chemistry, free radicals are highly reactive particles which play an important role in many chemical processes. These words were chosen as an extra-musical metaphor for the mercurial musical interactions which occur instanteneously in these performances between the performers. 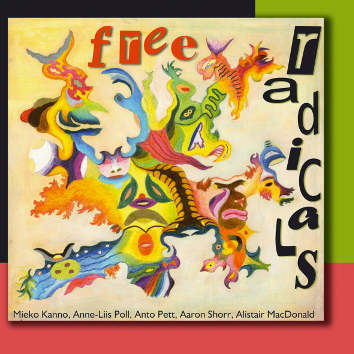 Free radicals are: Mieko Kanno - violin, electric violin, Anne-Liis Poll - voice, kalimba, manzira, kazoo, rattle percussion, Anto Pett - piano, Aaron Shorr - piano, Alistair MacDonald - live electronics. The CD is amazing musical fireworks and vocal pyrotechnics of Anne-Liis Poll is simply astonishing.